You are here: Home » Live from New York, It’s Saturday Night! When Saturday Night Live premiered, I was just about to my sixth birthday, so due to good parenting, I didn’t see much of the first four or five seasons. My first real memory was when my parents too my brother and I over to another couple’s house sometime around 1980 and while the adults were busy talking and drinking all evening, we were left to hang out with the children of the other couple. Their kids were more than five years older than we were and while they made good-hearted attempts to play with us, things started to drag as the night went on. What is a teenager to do? Turn on the television. “Buh-Bye” – In a skit where two flight attendants are making fun of passengers as they deplane, they accompany each insult with a “buh-bye”. I use this when I just want to dismiss someone with a little fun. “Makin’ Copies” – Rich, the guy whose desk is near the copier can’t help but comment on everyone and when he just can’t come up with something he notes they are “making’ copies”. When I find I am spending a lot of time at the copier, that catchphrase runs through my mind. “Daaaaaaaa Bears” – One of the greatest collection of big guys on the stage at once, the immortal Bears fans discussing everything Ditka. Every NFL season brings “Da Bears” to mind. “Living in a van down by the river” – Chris Farley as a bad motivational speaker talking about his living situation. I have slept more than one night in a van down by a river! Check out the list and accompanying videos here. Fresh pineapple or canned? “Talk amongst yourselves”. I love red onions. It will make you want to “consume mass quantities”. 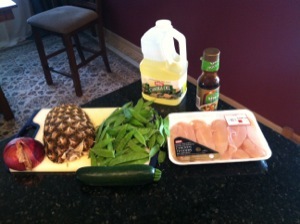 The pineapple will “pump….you up”. 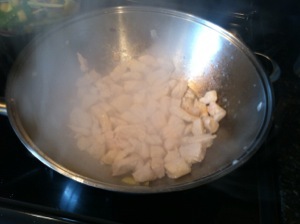 In a wok or large skillet, heat 2 teaspoons of the oil over medium-high heat. 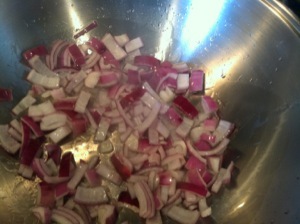 Stir-fry red onion in hot oil for 2 minutes. 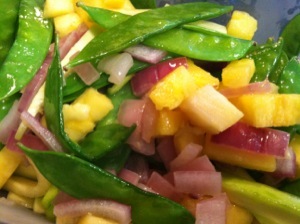 Add pineapple pieces, zucchini, and pea pods. 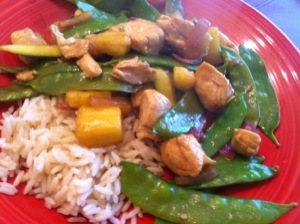 Stir-fry for 2 minutes more. Remove mixture from wok. Add the remaining 2 teaspoons oil to hot wok. Add chicken. 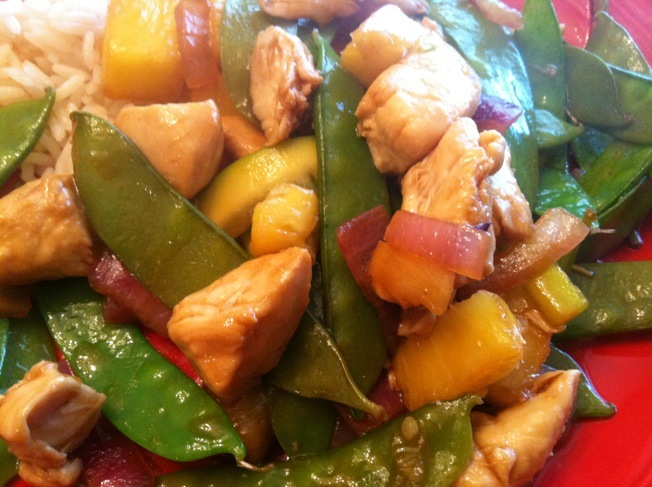 Stir-fry for 2 to 3 minutes or until chicken is tender and no longer pink. Return onion mixture to wok. 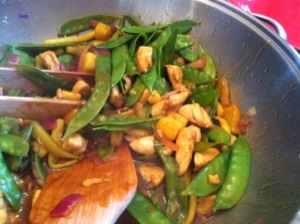 Add stir-fry sauce. Cook and stir about 1 minute or until heated through. If desired, serve with fresh pineapple wedges. Makes 4 servings. This looks delicious! I love SNL! Sounds delicious and east to make gluten e.